Our premier solid body guitar maker? Quite possibly. As one of our most experienced guitar makers, Suffolk-based Martyn Booth epitomises our UK craft. His down sized ES-335-style solid bodies draw on plenty of inspiration from the past, and yet he uses a thoroughly modern construction approach by having the neck and bodies rough cut to high exacting specification, leaving the all-important neck-to-body fit, assembly and set-up to his very experienced hands and eyes. This results in some seriously good guitars, and in healthy numbers – approximately 40 a year – at professional yet sensible price. They’ re played by the like of John Etheridge and John Wheatcroft. The Deluxe is the latest in the slowly expanding MB line. It’s either a carved top version of the Special (reviewed in issue 308) or an all-mahogany version of the Signature (reviewed in issue 285). Whichever way you view it the Deluxe sits nicely between the two, both in terms of feature and price. The all-mahogany body follow the same downsized ES-335 outline of the other MB guitars; here the maximum body depth is approximately 50mm, the top has a classic Gibson-like carve with a tight edge radius; the back adds a deep ribcage contour and fuller edge radius. The slightly pitched-back neck joins the body at the 20th fret – the joint is very tidy with a quiteclassic heel and mid-depth profile (21.2mm at the first, 23mm at the12th) a sort of ‘C’/’D’ hybrid that feels comfortable and business like, neither clubby nor thin. Martyn Booth is a very considered maker and gives the impression that ‘if it ain’t broke … ‘ could be his motto. The unbound ‘board has simple dot inlay, finely fitted Dunlop frets (2.79mm wide by roughly 1.4mm high) and a 14-inch radius that will be changing to a 12-14-inch compound radius on future model. The black finished back-angled headstock with clean Martyn Booth signature pearl logo and Deluxe engraved truss rod cover is also a classic look. The finish – a thin satin polyurethane – is tactile with an open grain and is designed to age quickly. Like the design there are no unnecessary unproven facets to the hardware and electronics. Sperzel locking tuner Hipshot vibrato (a close cousin of PRS’ ultra classy design), Seymour Duncan Jazz (neck) and JB (bridge) covered hum bucker, master volume, master tone (with push/push coil-split) and three-way toggle selector. Its tried and tested simplicity exudes confidence and you just know that it’s going to sound great. There’s a wonderful, chiming, Iively acoustic resonance to the Deluxe and despite its substance, strapped on it’s welI-balanced and ready to go. Immediately it feels like an old friend the dirty bite of the bridge JB is engulfed by a dark resonance that’s juicy and very rock/blues ready. The Jazz is a good match, widening the sound in a very soulful and bluesy way. The push/push coil-split witch on the tone control is very fast to use and neither split sound disappoints – cleaner and brighter with a lower output but never spiky. The volume and tone control feature smooth tapers and a good value tone capacitor creates a very musical and usable full-off ‘woman’ tone. If pristine highs are your bag you might want to look at a maple topped version; the Deluxe is for those who prefer a rounder high end be it clean with a little volume and toner reduction for convincing lounge jazz, or fully wound up for sweat-soaked soloing and riffage. lt’s a very grown up guitar, deceptively versatile and with an excellent, in tune vibrato system. 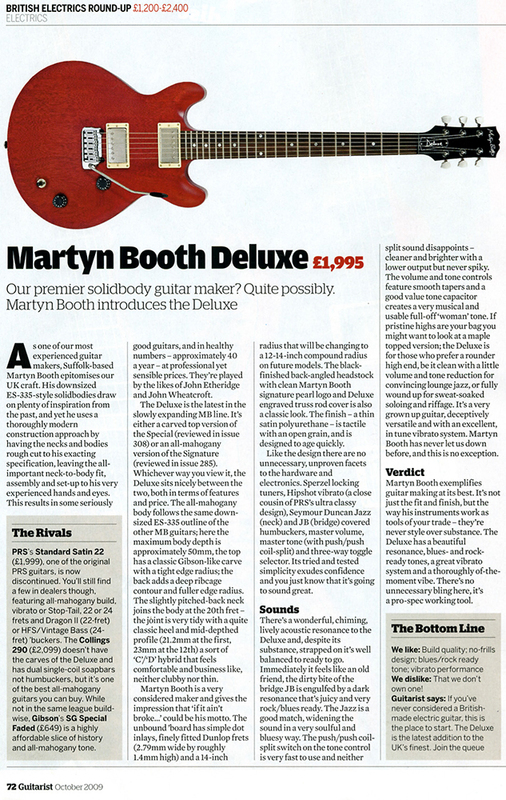 Martyn Booth has never let us down before and this is no exception. Martyn Booth exemplifies guitar making at its best. It’s not just the fit and finish, but the way his instruments work as tools of your trade – they’re never style over substance. The Deluxe ha a beautiful resonance, blue – and rock ready tones, a great vibrato system and a thoroughly of-the moment vibe. There’s no unnecessary bling here, it’s a pro-spec working tool. We dislike: That we don’t own one! Guitarist says: If you’ve never considered a British made electric guitar, this is the place to start . The Deluxe is the latest add it in to the UK’s finest. Join the queue. PRS’s Standard Sat in 22 one of the original PRS guitars. is now discontinued. You’ll still find a few in dealers though. featuring all-mahogany build, vibrato or Stop-Tail. 22 or 24 frets and Dragon II (22-fret) or HFS/Vintage Bass (24·fret) ‘buckers . The Collings 290 (£2,099) doesn’t have the carves of the Deluxe and has dual single-coil soapbars not humbuckers. but it’s one of the best all-mahogany guitars you can buy. While not in the same league buildwise, Gibson’s SG Special Faded (£649) is a highly affordable slice of history and all-mahogany tone.